The AR2000 laser distance meter is a highly accurate laser measurement sensor that is designed to work extremely well outdoors, in bright lights, and on hot targets. With the ability to take accurate measurements from distances up to 500 meters away, and a measurement frequency of up to 100 Hz, it is the perfect laser for a wide range of applications, including measuring the position of cranes; measuring the length of lumber, pipe, bricks, and other targets; measuring the position of hot metal targets, such as steel and aluminum; and much more! 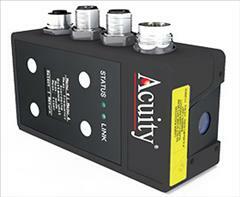 As with all of Acuity’s laser sensors, the AR2000 is optimized for easy integration into industrial automation and measurement systems.